Bridging the gap between missing teeth. 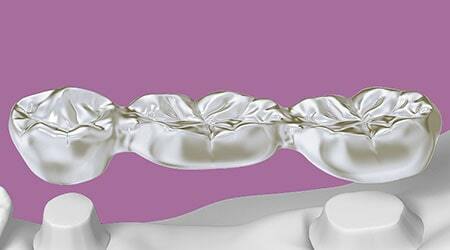 Dental bridges are used in dentistry to “bridge” the gaps where a tooth or teeth are missing or have been removed. The procedure involves artificial replacement for the loss of teeth characterized by a crown that replaces the lost teeth. The bridge is made up of two caps known as crowns and an artificial tooth. Traditional Fixed Bridge: This is characterized by placing a false tooth over the gaps left by the extracted tooth and held in place by abutments. Cantilever Bridge: Characterized by connecting the false tooth to one side of your remaining teeth beside the gap left by your missing tooth. Resin Bonded Bridge: Recommended if you have lost your front teeth. Requires that you have strong and healthy abutment teeth to hold the bridge in place. Why Will Dental Bridges Help You Smile? It is quick. With the latest development in dental technology and cosmetic dentistry, fixing the dental bridge is easy and quick. The whole procedure requires two visits to the dentist’s office. Natural in appearance. Dental bridges are customized to blend with the color of your existing teeth. The reason behind this is to make sure your dentition is uniform. Improve your appearance. Dental bridges fill up the spaces left behind by missing teeth. The dental bridges will maintain your facial tone and prevent changes in your facial musculature. Long lasting. If you maintain good oral hygiene, dental bridges can last from 10 to 15 years maybe more. During this period, the dental bridges will prevent your teeth from tilting, drifting, and shifting into space. Effective. Dental bridges will give you a healthy, uniform smile and give you a larger space for chewing. During the first visit, the dentist will take an impression of your teeth. This will be used to customize a dental bridge. During the first visit, the dentist might have to remove a thin portion of your enamel to prepare it for the procedure. The dentist will then fix temporary bridges to prevent exposure of the teeth and gums. The doctor then sends the impression to the dental lab. The second visit is all about testing the fit of the bridge. The fit has to be perfect before the dentist fits it in. If you settled on a permanent dental bridge, the dentist will leave the bridges temporarily for two weeks before cementing it permanently. I've been going to TLC Dentistry for almost 20 years now, and I love it there! They always seem to have the latest cutting-edge technology, they do great work, and I get compliments often on how nice my teeth look. Thank you, TLC for the great and professional work! Smile with confidence with quality dental bridges from our highly-trained dentists.